Click here for a sample of ANC005. 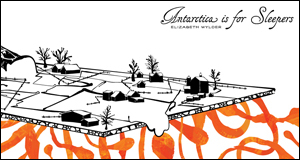 What we have here is Elizabeth Wylder’s dynamic poetry collection that is an “impermanent press” of poses, from the midnight-boozed poet to the woman-child still hiding at the dinner table. Here Wylder creates timeless images from the American expanse and wraps them in modern narratives best read breathlessly. We also have here a romantic international line-up of riff raff, from Baghdad body contractors to a Colombian drug lord whose waistline is expanding inversely to his fortune. In a word (or many) what we have here is pop culture, personal experience, and wry observation of everyday life mixed into a frothy, rhythmic, and accessible concoction. Antarctica is for sleepers, but Antarctica is for Sleepers is for doe-eyed, fleet-footed day-dreamers. ANC005 is out of print.